Rules of Golf: Has Phil Mickelson Been Bending the Groove Rules? Until now I have refrained from getting embroiled in the raging debate as whether professionals should be using the 20-year-old Ping Eye 2 wedges, or not. If you don’t know what I am referring to then I recommend that you Google “Phil Mickelson and Ping Eye 2” for several thousand opinions on the matter. The reason that I have been avoiding the subject is that the Rule is irrelevant to all amateur and most professional golfers. Unless you are an elite level professional golfer playing on one of the tours, where the Rules of Competition enforce the use of the new groove and punch mark specifications, you will not be affected for many years. In fact, all pre 2010 conforming clubs will continue to conform to the Rules of Golf until at least 2024 for you, me and the vast majority of golfers (probably more than 99.9%). 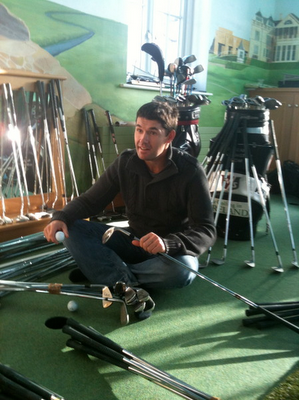 I am breaking my silence because today I came across a report of a press conference with Padraig Harrington, at which he talked about his views on this issue. For me, his opinions are the most lucid and sensible that I have read. I strongly recommend that you read this entry on the IrishGolfDesk. "As regards what I feel about whether it's right or not, I don't know what the direct comments were by Scott McCarron, but I think most of us were brought up that you've got to adhere strictly by the Rules, and whatever those rules are in place, you've got to play by them. "We've all played in our career where we've hit it on the cart path and got a drop, and that drop has been substantially to our advantage, and that's the nature of the game. Other times you get a drop and it's... the Rules are substantially against you. "You know, it swings and roundabouts in that sense, that you can't... you have to play exactly by them. You can't necessarily... the interpretation of them, that leads to problems and has led to problems over the years, so that's why we stick by it." Thanks Padraig, you’re an Irish gentleman and a scholar to boot. Author of the book, ‘999 Questions on the Rules of Golf’, written to help you learn the Rules the easy way. I agree that Paddy is a scholar and a gentleman - but in the USA, even a Supreme Court decision isn't written in stone for all time. He can't say it because he isn't a US citizen, and I hope it can be said in the UK, but who are we to NOT think we can overrule the Supreme Court ? If it can be proved that the court's decision was wrong - which I personally believe it was - that decision can be pulled from the books. In this case, the court presumed to legislate in the runnings of a private business - the PGA Tour. Ping got away with it and the rest is history. On to a real question - Barry - aren't the USGA and R&A rulebooks pretty much identical since the mid-90's after the Callaway driver fiasco where the USGA declared one of their drivers illegal, but the R&A allowed the driver ? Someone has suggested that the PGA Tour adopt the R&A rules to get around the court decision on the Ping Eye 2 grooves. There's a reason pros with broomstick putters don't use them for measuring relief, despite the Rules allowing such. Integrity. By all means, play the Pings, measure with a broomstick, but expect a backlash. You are correct in that since some Appendices items on equipment and Local Rules were harmonised in 2000 there is only one unified Rules of Golf agreed by the R&A and USGA. In fact, there is only one subject on which they disagree. You can read about this on my blog at http://tinyurl.com/yasabou (December 4th 2008). It is also the 999th question in my book, '999 Questions on the Rules of Golf'. Good point. I completely agree. Although, to be fair, I think that Phil Mickelson is trying to make a point in that he thinks the new groove Rule of Competition is crazy (backed of course by Callaway! ).